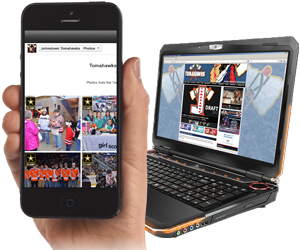 Reach out to our ever-growing online fan base by promoting your business through the Tomahawk’s official website (in-season average of 39,000 page views per month), social media pages (12,000 + “likes”), or the weekly E-newsletter (6,000 subscribers). Options include banner advertisements or social media posts announcing a promotion connecting your business to the team. Or, place your logo on the hundreds of game photos uploaded to Facebook following each home game, or on downloadable e-wallpapers. The Tomahawks are constantly developing new ways engage our fans – including a variety of printed materials distributed throughout the year. Sponsorship opportunities include advertisement panels on the more than 80,000 pocket schedules we distribute, special offer advertisements printed on the backs of tickets, or coupons in the variety of ticket books created for season ticket holders or fundraising organizations. 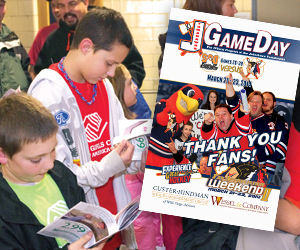 Nearly every respondent in our fan survey said reading the GameDay Program is a key part of their game experience, making the free publication a prime place to advertise special deals and promotions. With a variety of ad sizes and packages available, your ad can be updated monthly to keep your message fresh all season long. As an official sponsor of the Tomahawks Kids Club, you’ll present special deals for Kids Club members and Tomahawks birthday guests, or your business can even host your own Kids Club event. Develop exciting new ways to drive traffic to your business through your partnership with the Tomahawks. 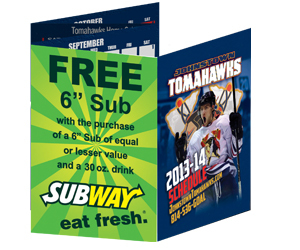 Be part of our print or television advertising campaigns, host a team appearance, or offer exclusive Tomahawks merchandise or collectible items available only at your business.